You might be thinking that I am going to talk about yesterday’s wedding between PKP & Julie Snyder, right? Suprise! No, not at all. Yes, it was political. Yes, it was a major event. Today’s topic is on an interesting, non-scientific poll conducted by Le Journal de Montréal. Le Journal asked Francophone readers (primarily in Montréal) what they believe are the political affirmations of numerous Québec and Canadian celebrities. There is no scientific basis for the responses. But I’m not sure there has to be. Sometimes perceptions speak louder than facts. In the minds of ordinary people, the public likes to view celebrities through one’s own affirmations. In that sense, this poll may signal how the public politically views its pop-culture elite, and perhaps it may hint of where we might be heading politically (perhaps…) — at least from the perspective of people in Montréal. The Poll is entitled: Pour qui ces personnalités canadiennes votent-elles? (For who are these Canadian celebrities voting). Bloc Québécois : 2.62% (Really!?! She doesn’t even live in Québec! Like I said: “unscientific”). This is an interesting one. For 30 years people have been speculating what Celine’s political tendencies may be. Sovereignists love to believe she’s in their camp. Federalists love to believe she’s in their camp. Celine seems to love everyone and seems to do all the right things – which just leaves everyone confused (for example, her best friend is “Super-Separatist Julie Snyder – Queen of all that separates!!”. Yet Celine’s name did not appear on the list of artists who signed to support PKP’s contribution to culture, nor did Celine attend her Julie’s and PKP’s wedding – Like – HOLY CRAP! Slap ‘n the face to your “best bud”!!). As usual, we’re all left guessing (if it even matters). And the poll numbers also leave us in the dark. Readers of Le Journal de Montréal (PKP’s own newspaper) tend to think that Celine is much more in the federalist camp, with 64.18% of readers believing she will vote for federalist parties. Which parties? You’ve gotta be kidding me!!! I’ve always thought he’s half-drunk, running around at -30 with no clothes on. Hell, I’m not sure I’d even want to get close, for fear of what it / he might do to me. I suppose there are two ways to look at the poll results. 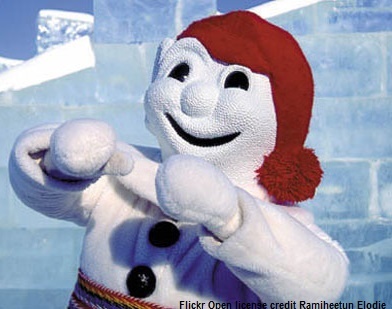 Mr. Bonhomme is representative of hard-core Québec culture. Therefore, people may be making associations with hard-core culture and politics. When I saw the poll results, I tended to believe it is the later (point 2)… solely because there is a chunk of people in Montréal who tend to think that people in Québec City are “right-wing federalist nuts” (on one hand, that’s an exaggeration, but on the other hand there are people in Montréal who actually lump Québec into such an unflattering category). Bloc Québécois: 42.78% (I’m sure those who gave this reply viewed it from the perspective of point “2”). Conservative: 30.3% (I’m sure those who gave this reply viewed it from the perspective of point “1”). Green Party: 13.9% (Really? Serious? With Lévis’ oil refineries, Québec City’s car-loving culture, with how Montréal views Québec City as the gateway to the North’s forest choppers, etc. etc. Seriously??). I don’t think this way – and I love Québec City (I did part of my University at Université Laval in Québec City), but I know a good number of people in Montréal who do hold such terrible view of Q.City. Perhaps “white as snow” is associated to be “green as the grass” in the minds of some people in Montréal (I always see a lot of “yellow” in the snow in and around downtown Montréal… so hey… it’s possible). Bloc: 2.9% (Again, seriously!?! The dude is Anglophone from Toronto, and only recently moved to Montréal. I don’t think he got off that much on Julie’s wedding dress). Bloc: 2.27% (I’m really trying to bite my tongue here!! REALLY!! Myers does’t even live in Québec and is Anglophone. How is it that the same 2% of people thinks that everyone in the world votes Bloc and thinks like them? Who actually thinks this way?? Oh I know… the PQ caucus and the Le Devoir newspaper staff. Of course, it’s them who answered this question). Green: 38.61% (Because silicone is good for the environment). Bloc: 2.68% (Same bloody group! Anyway, I can’t say anything, because I long ago chewed off my tongue from having continuously bit it so hard!!!). 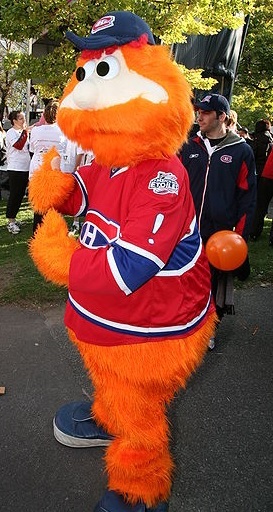 Youppi is the the former Montréal Expos baseball team mascot, and now the Montréal Canadiens hockey mascot. And the final verdict? NO WAY to know what the heck will happen in the next election (but it looks like the Bloc won’t get very far). By Quebec Culture Blog 101 in Uncategorized on August 16, 2015 .